Glossy clear Laminate gives extra protection from UV and abrasion. 4 year outdoor rated. Standard popular round sizes, can be made in custom sizes by request. If you have any questions about this product or how to order please contact us. 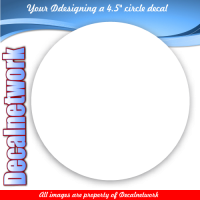 If you are looking to place a larger order and want to see our decal quality you can email us a request a sample.